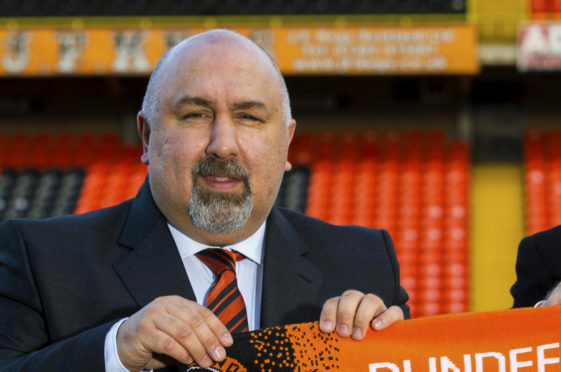 Dundee United Sporting Director Tony Asghar. Club owner Mark Ogren has made it clear there will be no “cutting corners” for Dundee United in the summer – as the Tangerines prepare to either establish themselves in the top flight of Scottish football or flex their muscles in the league below. Sporting director Tony Asghar has revealed that his budget to assemble a squad fit to compete in the Premiership will be the same as a budget to win the Championship. Though the short-term future on the field is unclear, for Asghar there is off the field clarity. “People talk about running two different plans,” he told Courier Sport. “A Plan A for the Premiership and a Plan B for the Championship. “For us, there won’t be much of a difference whichever league we’re in next season. Paul McMullan and Mark Reynolds recently agreed contract extensions without knowing which league United will be playing in. “They understand that vision,” said Asghar. “They want to be here because they can see that we are building something special. “There has been a lot of talk in the last few months around why would you buy a Scottish football club? “We did a lot of due diligence into the finance of football. “We believe that with the right infrastructure and the right people you can make it a profitable business as well as having a successful team on the pitch for the fans. “If we were going to go down the line of cutting corners, the owners wouldn’t have come on board. Asghar has revealed that United fans can expect to see more signings from abroad, with Ian Harkes unlikely to be the last American to make the move to Tayside. “We’ve cast our net for a number of overseas players,” he said. “With Gordon Forrest’s links to the MLS and our network over there we really want to look at bringing more US players over. United won’t forget the players already under their noses who could be ready to make the new step forward, like Scott Banks who has been a big hit with Clyde on loan. Asghar added: “We’ve put a lot of good young players out on loan. There are a few doing really well. “Having a big squad isn’t the best. A lot of players aren’t happy if they’re not involved – especially good players. After a few months of owning United, the Ogrens have been well and truly bitten by the tangerine and black bug. “They watch every game and a lot of other games in Scottish football,” said Asghar. “They know everything that is happening. “They are so passionate about this. They’re immersing themselves in it. “None of us were brought up Dundee United fans but we eat, sleep and breathe the club now.